Start with a dynamic warm-up at the main stage led by our run leader. This is a 5K (+/-) your way, so don’t sweat it. Our run leader will be right by your side as you take the first step of the mindful triathlon. Complete the mindful triathlon with 25 minutes of soul-reviving meditation led by world-renowned spiritual leaders. We have everything from aerial yoga and AcroYoga to tarot readings and bodywork. Premium packages can sign up in advance and everyone else can drop in. While you’re at it, check out the Kula Market, chill in the grass, or fuel up with healthy eats like our signature Wanderbowl. We’re proud to announce the renewal of our partnership this year with (RED) in the fight to end HIV/AIDS. For every Wanderlust 108 ticket sold, Wanderlust will donate $1.08 to The Global Fund to Fight AIDS. That donation is enough to provide 5+ days of life-saving HIV medication. Wanderlust is also offering attendees a WAN(DER)LUST Package featuring (RED) products and will donate $16 of the package proceeds to The Global Fund. Every purchase of a WAN(DER)LUST Package could provide 80+ days of life-saving HIV medication. Help us #endAIDS. Our R+Y+M general admission ticket offers entry to the complete mindful triathlon. You’ll receive a complimentary fandana at registration. R+Y+M ticket offers drop-in access to bonus activities. $1.08 of your ticket purchase price will be donated to our 2018 global charity partner, (RED). The Y+M ticket includes general admission entry only to the yoga + meditation portions of the event. Does not include a complimentary fandana or access to bonus activities. A Wanderlust tote bag containing a Manduka x Wanderlust mat, a Wanderlust S’well bottle, and a fandana ($90 value). Wanderlust 108 picnic lunch ($20 value). Optimal mat placement at front of stage. Priority, pre-scheduled access to bonus activities. $12 of your ticket purchase price will be donated to our 2018 global charity partner, (RED). Only 50 Charity Packages available. A Wanderlust tote bag containing a Kulae yoga mat, a Wanderlust water bottle, and a fandana ($50 value). Premium mat placement near front of stage. Only 200 108 Packages available. Wanderlust 108 is even better with friends. If you create or join a group of four or more people, each group member will receive a $10 credit* on purchases of $20+ on-site at the adidas x Wanderlust shop. Click the button below to create a new group or join an existing group. After creating the group, you can purchase your ticket or package. Have a really big crew? Reach out about large group tickets here. *Credit cannot be combined with other discounts or offers. Does not apply to holders of discounted or complimentary tickets. Picnic lunch includes a Wanderlust Wanderbowl—a hearty, wholesome gluten-free rice bowl, available vegan or vegetarian; seasonal fast fuels, fresh fruit, and a Flow Alkaline Spring Water. Your picnic lunch also includes a separate, expedited pick-up line open from 10AM until the end of afternoon classes. Wanderlust is donating 100% of the Carbon Offset Ticket to Trees, Water & People. By adding a carbon offset to your ticket purchase, you are contributing to the overall reduction of CO2 emissions on the planet with TWP's reforestation program. Leave your yoga mat at home and demo the latest and greatest in Manduka mats! For $5, you'll be able to rent a Manduka mat. Only 200 available. Mats are likely to sell out, please reserve online. 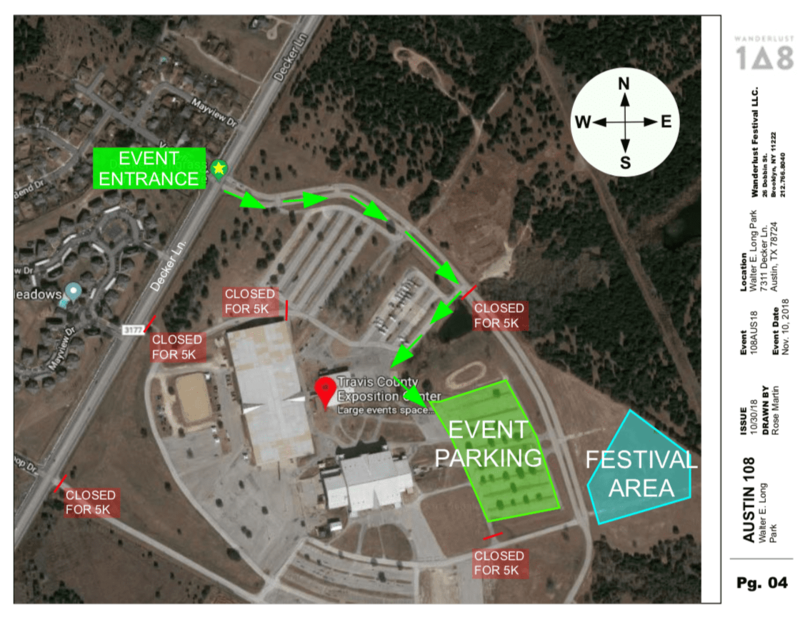 Parking is available in the east lot of the Travis County Exposition Center behind Leudecke Arena. Please be sure to enter the property from the north entrance #1 off of Decker Ln. as the other entrances will be closed for the 5k. Exclusive access to bonus activities – spaces may be reserved in advance. What is a bonus activity? Wanderlust (RED) and Wanderlust 108 Packages allow you to sign up in advance for one bonus activity such as acroyoga, hooping, aerial yoga, flying therapeutics, bodywork, and essential oils workshop. If you purchase this ticket, you will receive an email with instructions for making your reservation. If you have a Wanderlust 108 Ticket, you may drop-in to a bonus activity once you are on-site! Wanderlust 108 Practice Tickets do not get access to Bonus Activities. Your bonus activity will follow the mindful triathlon. Yes! Kids can also participate. For those 18 and under, tickets are free when accompanied by a ticket-buying guardian. Strollers are welcome as well, we just ask that you are mindful of others walking and running on the 5K course. There will be picnic lunches available for purchase online before the event! You also may bring a picnic lunch or snacks if you’re so inclined. Stop by the True North Cafe to grab a coffee or healthy snack or a Wanderbowl. The Wanderlust Wanderbowl is a hearty, wholesome gluten free rice bowl, available vegan or vegetarian; seasonal fast fuels, fresh fruit and sparkling water to enhance your mindful eating experience and provide substance during your afternoon activities. We ask that you’re respectful of consuming food during the yoga and meditation session. How can I pick up my product bundle? If you purchased a package that includes a product bundle, you can pick up your product bundle at check-in. How can I organize a group? Invite friends, relatives and partners to enjoy a day of movement with you. Take it further with costumes or matching t-shirts that represent your team spirit in the most festive way. Can I join a group after purchasing a ticket individually? Yes! You can. Please follow instructions here to transfer your individual ticket into a group. Get creative with costumes or matching t-shirts to represent your group spirit in the most festive way. Create or join a group of 4 or more and each member will receive a $10 credit on Wanderlust-branded and adidas x Wanderlust merchandise onsite. * Just select the group option when you buy tickets. From there, you can create a new group or join an existing group. You will receive a unique redemption token via email a couple of days before the Wanderlust 108. *$10 off of a transaction of $20 or more. Offer good in US and Canada only. Cannot be used on Artist Merchandise.